Whether it's six, twelve, or nylon strings (picked or plucked) GuitarStudio has the highest quality sound you'll find in any iOS app. 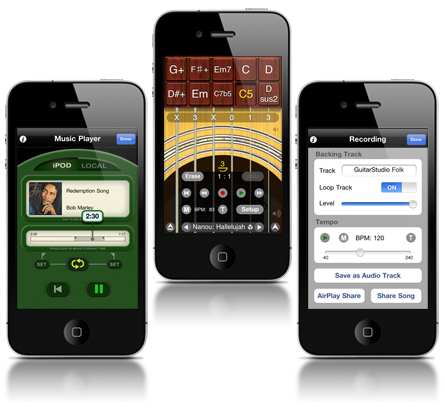 GuitarStudio has powered the biggest iPhone musicians and bands. Are you next? See GuitarStudio in action. Les invito a descargar esta aplicacion, vale la pena si en verdad, ademas de ser muy entretenida. Так же хороша как и электронный собрат! :) аккорд H независимо от того какой он - это B. For what it does and the price this is da bomb! You can shove any chord imaginable into it. 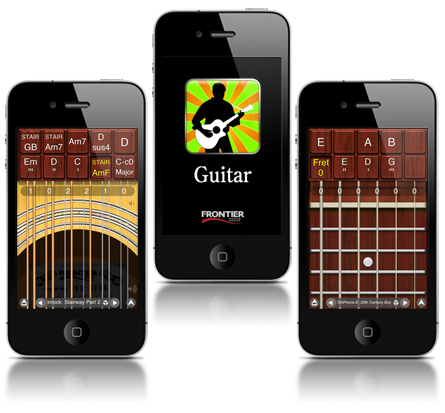 This is the best guitar app for iPhone/iPod touch. I've tried so many guitar apps and this is the only one you can actually play musically and write songs on. If u are a guitarist you need to get this app! Muito bem feito, reproduz os recursos do instrumento de forma muito criativa. J'ai fait un mini concert avec hier soir, Appli vraiment bluffante, et vraiment jouable. I have ALL the guitar apps and this one is the easiest to actually play music on. Push a button and strum your chord. It don't get much easier than that. I love it. Pleased with this app. Works great! Eu testei varios e este é de longe o melhor simulador. This is the App that in my mind 'broke the sound barrier'. It outdistanced anything I had ever seen and would NEVER have believed possible back in the day. I have owned this since it came on the market and it still blows my mind. It really is THAT good!! Much as I like some of the others, this is my fave because you can line up all the chords in your song and then just strum away in your own style. I had purchased 3 gtr apps already and this one is finally playable! Thanks FDG! The sound and features are incredible for the price. Es facil. Divertido, el sonido es muy bueno y es muy sencible al tacto. Everyone seems to agree and they're right! This is the most fun, most versatile, most playable guitar app around. Thanks. This is mind blowing. You can make music on this instrument quickly and easily. It is way beyond the other guitar apps for its ability to let you focus on music making without feeling like you are going against the technology! If you are a musician you will be smilling in moments after you load this in to your phone. Very REAL sounding !! 10 stars. I plug into my pa for a few tunes While gigging and play the guitar on my phn. Crowd loves it !!!! I'm new at playing guitar and this has helped me a lot when trying different chords. This is a must for aspiring guitar players. 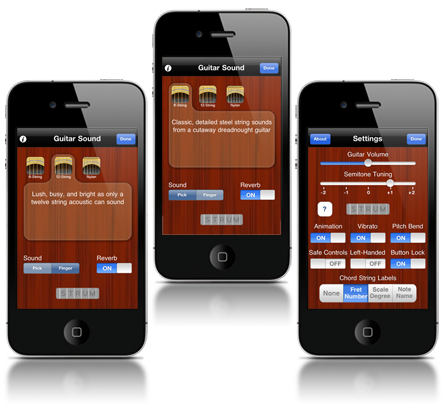 GuitarStudio is a portable acoustic guitar app unlike any other. Beautiful sound wrapped in a highly playable interface means you can perform favorite songs or compose something new, no matter where you might be. Play using six string, twelve string, or nylon string sound packs, plucked or picked, even with a dash of reverb if you need it. No music experience required! Beginners will enjoy the included starter songs and easy accessibility of the playing interface. Six-string gurus will love the convenience of this portable music notepad, with tools to manage and backup songs, and even share with others. GuitarStudio provides a playing interface that's powerful and easy to learn. Create your songs from a huge library of over 2000 built-in chords, scales, and fret positions. 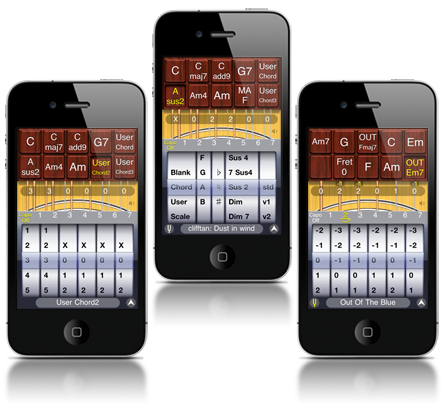 Or create your own custom chords and tunings. Buttons provide immediate access to all the chords and scales you need for a song, making it easy to switch between strumming chords and playing melodies. Looking for inspiration or are you looking to share your music with the world? 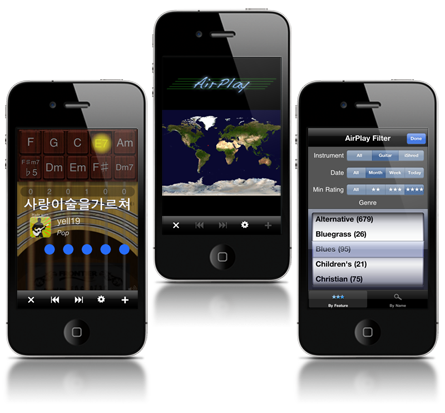 GuitarStudio features AirPlay with over four thousand shared songs from all around the world. Sit back and listen or download songs to learn. You can upload your own creations to AirPlay and let the world listen and rate it.